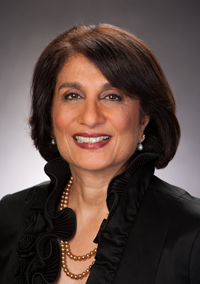 Dr. Rohini Anand is Senior Vice President and Global Chief Diversity Officer for Sodexo, a leading provider of Quality of Daily Life Solutions with $20 billion or 13.4 billion euro in annual revenue and nearly 420,000 employees in 80 countries. In her current role, Dr. Anand is responsible for the strategic direction, implementation and alignment of Sodexo’s integrated global diversity and inclusion initiatives, as well as Sodexo USA’s sustainable development and corporate social responsibility strategies. Today diversity and inclusion and sustainability are drivers of Sodexo’s business growth and progress. Previously, Dr. Anand served as Senior Vice President and Chief Diversity Officer for Sodexo USA, where she led the organization’s overall diversity and inclusion strategy. Dr. Anand was responsible for designing and developing the organization’s sustained culture change initiatives and its integration in the overall business growth strategy. Under Dr. Anand’s leadership, Sodexo received the prestigious 2012 Catalyst Award and was ranked #1 in 2010 and #2 in 2012 and 2011 on the DiversityInc business index of Top Companies for Diversity and Inclusion. In addition, the National Restaurant Association awarded Sodexo its Faces of Diversity Inspiration Award and Working Mother Media has named Sodexo a Best Company for Hourly Workers for the third consecutive year. Today the Sodexo brand is synonymous with diversity leadership. Sodexo’s remarkable culture change, led by diversity and inclusion, was featured as a Harvard Business School case study. Widely considered a leading expert on organizational change and diversity and inclusion, Dr. Anand has authored several manuals and has been published in numerous trade journals. Her works include texts on cultural competency and diversity training such as a chapter in The SAGE Handbook of Intercultural Competence (2009), Customizing Diversity Training Using Case Vignettes (2001), Multicultural Case Studies: Tools for Training (1999), Teaching Skills and Cultural Competence: A Guide for Trainers (1997) and Cultural Competency in Health Care: A Guide for Trainers (1997). Dr. Anand has also been the recipient of many prestigious awards and honors including the 2011 Mosaic Woman Leadership Award, the 2009 Women’s Foodservice Forum Trailblazer Award,, the Maryland International Business Leadership Award, the American Institute for Managing Diversity’s Individual Leader Award and Webster University’s 2008 Women of Influence Award. Dr. Anand received her PhD from the University of Michigan and serves on the boards of several organizations including the Gay, Lesbian & Straight Education Network (GLSEN); the Human Rights Campaign, Universities at Shady Grove, iMCI, the Catalyst Board of Advisors, the National Organization on Disabilities (NOD), the Asian Pacific American Islander Scholarship Fund (APAISF) and the Asia Society Diversity Council.